We could hardly contain our joy at finding banners officially proclaiming the Roebling Oil Building at the former Roebling Oil Field site at N. 11th and Roebling Streets in Williamsburg as Warehouse 11 (or W11 for short). This means the marketing and sales push are full speed ahead in 2008 for the luxe condo that has risen on the formerly contaminated site adjacent to a "localized oil plume." As luck would have it, we reached into the hard drive archive, which has hundreds of weekly shots showing the site when it was just-plain-foul-and-polluted, and selected one taken exactly a year before the shot on top. Ah, digital memories. 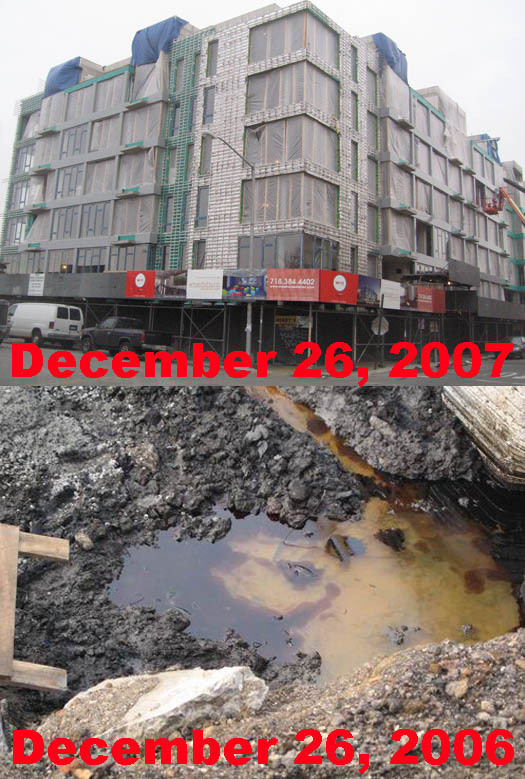 I'm very interested in buying a unit in this building but am kind of scared because of the oil contamination. I've seen stuff on the news about people working/living in some of these brand new buildings that were once contaminated who developed health problems. Does anybody have any thoughts about this? Please help me. I love idea of the place but don't know if it's worth the risk! Thanks! never ever in the history of new york real estate has a building been constructed where something previously industrial was. never - not since day one, this building is a TOTAL FIRST!! !